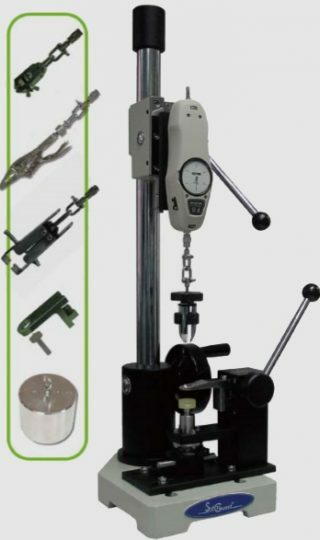 This tester Is the unique safety test instrument that provides a means to accurately measure how safe accessories are attached in a product. It is also used to compare a variety of accessories from different vendors in the process from product design to production so that we can safeguard our consumers. It is a simple but effective design mainly consisting of a high precision , gauge, a sturdy stand and special grips/clamps. It requires very little training. 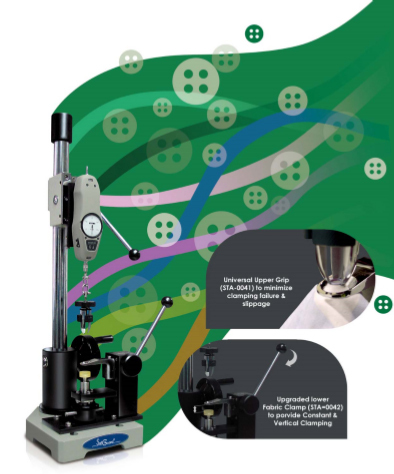 A sample required by standards & regulations is to fix horizontally (constant force is applied to secure the sample) so that snap or other accessories attached in fabric can be clamped into. Moreover, a standard weight is also offered so that it can be regularly checked if it meets the safety requirements. JAPAN Product Liability Law, ASTM F963, EN 71, M&S P115A (for snap)P115 (for button), ASTM D4846-96 and many others. C Economically exchangeable with a plenty of different of grips/clamps. D Longer Stand Spacious for more applications. – Constant Clamping Force to minimize operation error. – Vertical Clamping to minimize unnecessary test failure. (STA-004i) can accurately secure snap and does not damage the fabric. with capacity up to 30 kg. Test for female part of snap & male part of stud. can be also applied instead. mainly used together with STA-0005. or Plastic Buttons up to 30 Iigne. To protect the eye of operator.